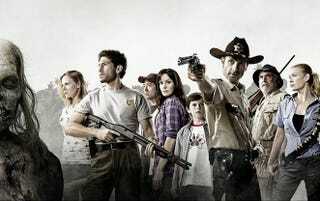 Here it is: the entire cast of AMC's The Walking Dead. It's pretty spot-on fantastic — even the colors make the world seem like it's in black-and-white, similar to the comic book. Plus check out pages from the new issue. So what do you think? I wonder if this gray haze that seems to be muting the colors and sky will carry over to the series? I can't imagine the new zombie world being bright and cheery, but then again, maybe that will make it even more terrifying? I guess we won't know for sure until we see the first footage. The image comes from Circle of Confusion, Skybound and Wired's invites to their San Diego Comic Con party, which is celebrating The Walking Dead series. Here's a wrap-around image from the Walking Dead omnibus cover, just for comparison's sake. Clearly there are some new characters, it could be considered a bit of a spoiler, so click on it at your own risk if you haven't read the comic. It's a good way to see how strikingly similar the two are, especially in tone. We also have a few pages from the brand new issue of The Walking Dead, issue 75. This is absolutely a spoiler if you haven't read the comic, but if you're itching to find out what happens next, sneak a look. Check out pages 6-8 of the new issue over at AMC.